Sauteed Portobello mushroom skillet is flavorful and so easy to prepare. It will take you only a few minutes to prepare this amazing side dish. Upgrade your meal! See how I prepare the portobello mushrooms further below in my video and get the recipe. Portobello Mushrooms are large Mushrooms with a wide brown cap, they are the grown version of the crimini and ultimately of the common button mushroom. That means all 3 mushrooms are from the same variety, just one is grown u and the others are baby or medium aged mushrooms. 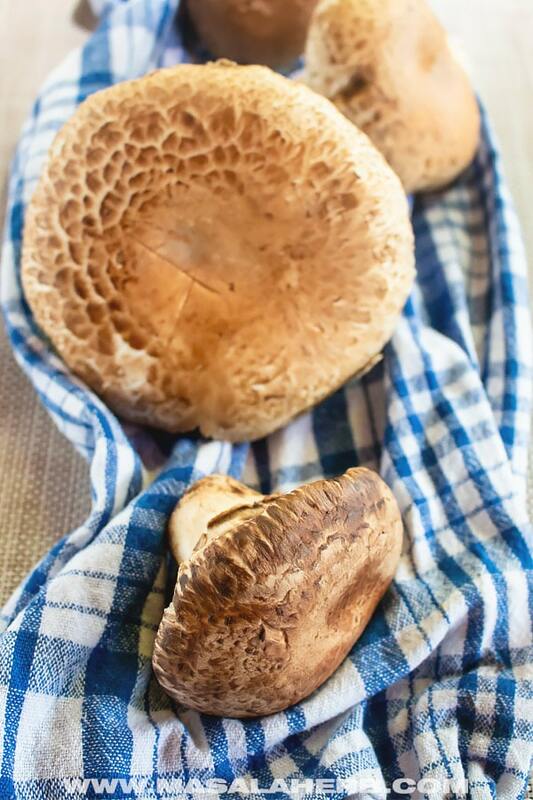 At the same time flavors are similar, however, the older the mushroom gets the more intensive the taste. So, button mushrooms taste rather plain why their big brothers have a more complex flavor to them when sauteed, stir-fried, grilled or roasted. 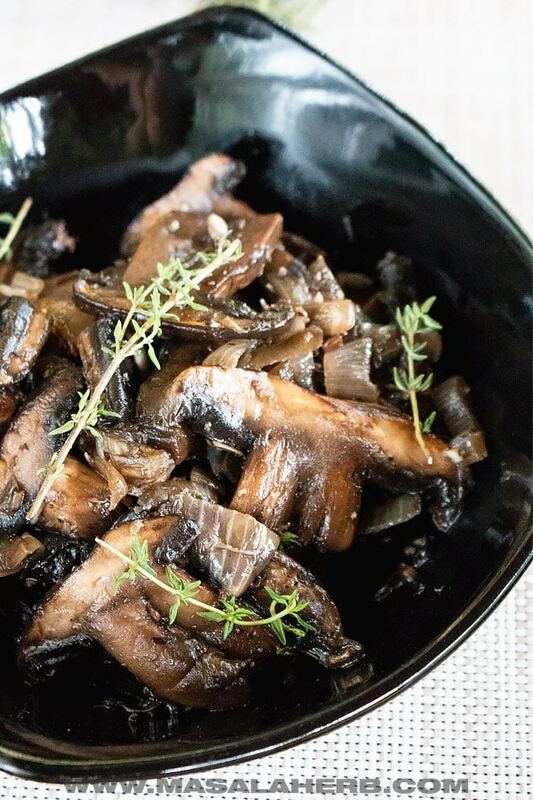 For this particular sauteed portobello mushroom side dish, you won’t need that many ingredients. The mushroom is going to lend the dish the flavors it needs and you certainly don’t want to mask these wonderful mushrooms with anything else. Yet, I do enjoy adding some fresh thyme sprigs to the portobello mushrooms while they sautee. You will enjoy the flavors! Thyme compliments mushrooms subtly. Garlic is another ingredient that will enhance your gorgeously cooking portobello mushrooms in the skillet. So don’t skip the garlic! Onion is my friend here as well and shouldn’t be missed. I sauteed the portobello mushrooms with butter. I just think it’s more suitable as it works with the other ingredients. 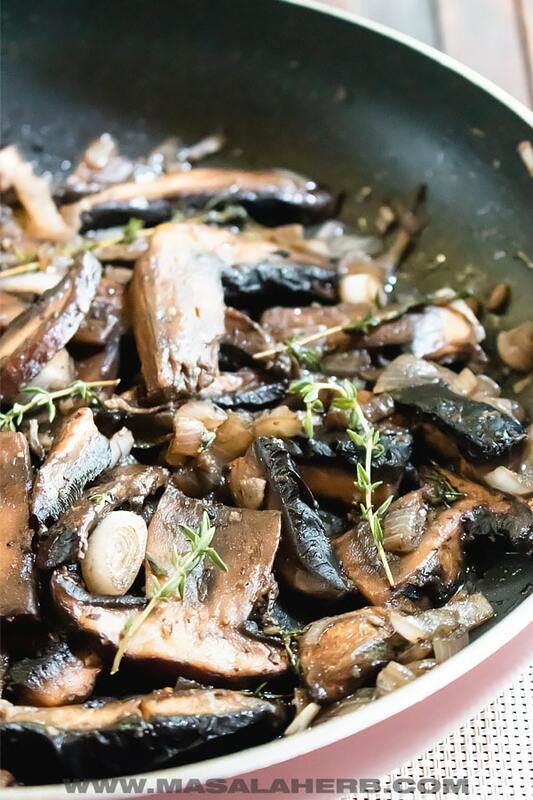 You can use olive oil too if you want vegan sauteed portobello mushrooms. White Wine Vinegar is the surprise ingredient here. The wine will add a nice acid touch to compliment the mushroom, thyme, butter, garlic, and onion. Without the wine, it would just be a boring side dish. 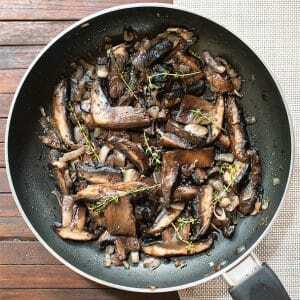 How to serve the sauteed portobello mushrooms? I think the best way to enjoy this side dish is by pairing the sauteed portobello mushrooms with a meat dish. It can be a saucy or dry meat dish, yet the saucier the better! How to Saute Portobello Mushrooms? To prepare the sauteed portobello mushroom, slice/cut all your ingredients before you start cooking. Then heat up your pan and fry the onions translucent, then cook the garlic and the sliced mushrooms. The mushrooms will lose water which is all good so they get sauteed gently until they reduce in size considerably! Season and pour in the wine which will dissolve instantly in a hot skillet. So make sure to stir everything after you have poured the wine. Then add the fresh thyme sprigs. Let the mushrooms cook so to take in the aroma of the other ingredients until you think the mushrooms are cooked, the sauce has dissolved and the taste is right. Perfectly sauteed Portobello Mushroom. Make this easy one-pan skillet side dish to serve with meat or meatless plant-based dishes. Heat up a skillet with the butter. Wait for it to melt. Add in your sliced onions. Fry the onions translucent. Then add all the sliced portobello mushrooms. Cook them so that they reduce and saute gently. Once the mushrooms have reduced in size, pour in the white wine and keep on high to medium heat. Stir cook for 1-2 minutes. Add the Thyme and let reduce on slow heat until all the liquid is gone. Serve hot as a side dish with beef steak, roasted chicken, turkey, pork chops, poached salmon or vegetarian meatless meals. See the suggestions in the post. You can use dried thyme too or omit it altogether, however fresh thyme really adds value and flavor to the portobello mushrooms. Dear Reader, How are you planning to serve these delicious portobello mushrooms? 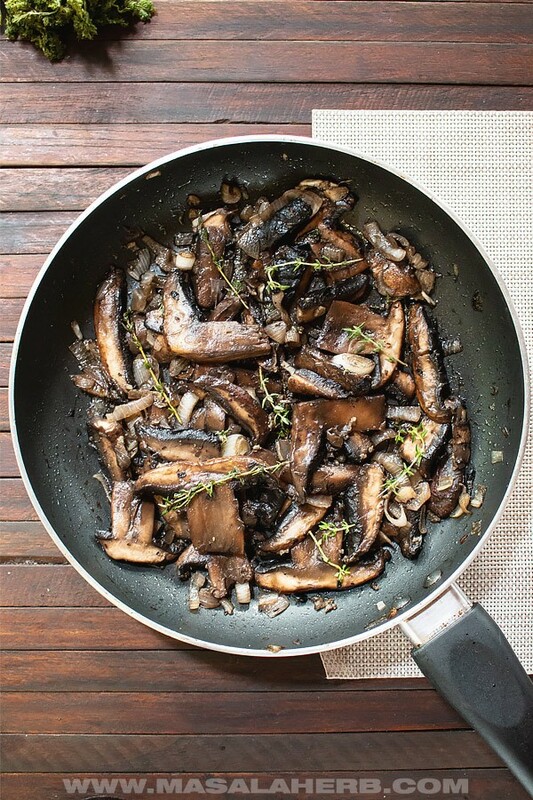 Hi, this may be interesting you: Sauteed Portobello Mushroom Recipe!